Okay, time for a confession. 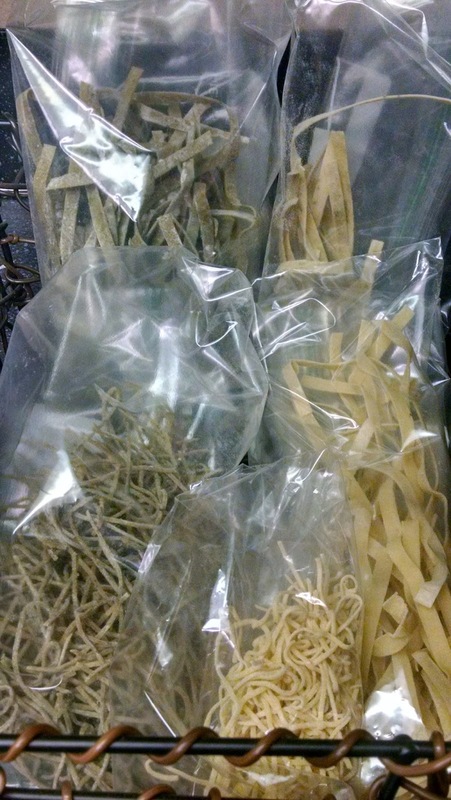 I have been making a lot of pasta, and I mean a lot of pasta! See?! Okay, just so you know I have basil and regular angel hair pasta, basil flecked fettuccine, basil pureed fettuccine, and standard fettuccine in the pasta basket. Not to mention all the dried pasta in my cupboard that stands ready to join the culinary battle at a moments notice. Making all of this pasta has been so much fun and I’ve enjoyed it immensely. Besides, you can never have too much pasta in the house in my opinion. Best part is that you can decorate your kitchen if you put the pasta in some tall glass storage containers and place them strategically throughout your kitchen. It is a great way to appear as though you have been slaving away in the kitchen for hours when you can get the same accolades for only 30 minutes of work. Who doesn’t love that idea, right? Anyway, I digress, so back to my confession. I have so much in my head that I want to say about pasta and pasta making, but figuring out how to write about all of it has been tough. It has slowed my pasta progress down a bit. But, I charge on to keep the blog rockin’. So, at this point we have covered most things about basic homemade pasta, but we are missing one big element. Sauce. That’s right, pasta sauce. Sauce really makes the pasta special and it can really make or break the dish. Granted, I could eat pasta with butter, olive oil, garlic, salt, pepper, and freshly grated parmesan all day long. Or, you can always break out my bolognese recipe by clicking here. However, I love that making pasta sauce is only limited by your imagination. Let’s face it, sometimes our imaginations aren’t enough and we need help. So, for some additional inspiration I began to scour the internet looking for a fun option for a sauce. Honestly, I wasn’t even inspired by what the internet had to offer. For some reason it seemed like all the sauce options were the same. I knew that I wanted a sauce that had a cream component, but I didn’t want standard Alfredo sauce. Also, I had some mushrooms that I wanted to incorporate as well. The only other thing I wanted was to have some acidity in the dish by adding lemon or lime in some way. So, I settled on a sauce that was a combination of Marsala sauce and Piccata sauce. 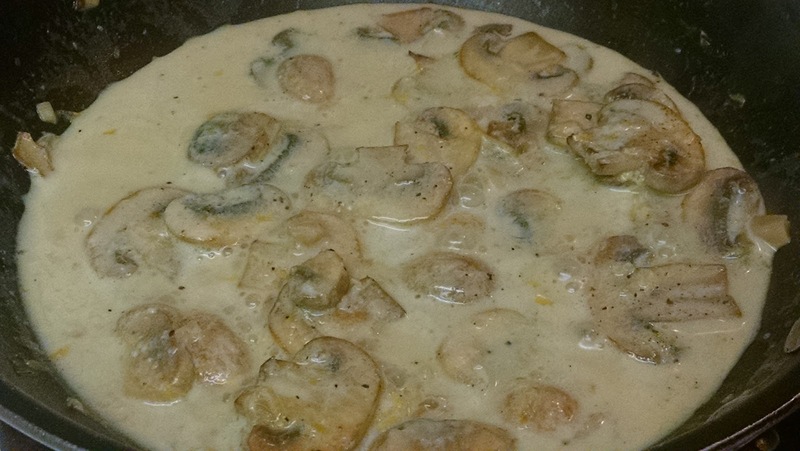 Marsala typically includes onions, garlic, herbs, mushrooms, heavy cream, oil or butter, and Marsala wine. Piccata, which refers to a cooking method more than a sauce itself, but generally is associated with lemon juice, white wine, garlic, and finished with a little butter. However, I don’t generally have Marsala around and I want to use what ingredients I have around the house. You will notice I just combined the elements of both sauces that I wanted and made it my own. So, I decided to saute some mushrooms, add a little roasted garlic, and some lemon zest. Then, I hit that with a little white wine until the alcohol cooked off, seasoned it with some salt and pepper, and at the last second tossed in a splash of half and half to reduce for a minute or two. I had no idea what the sauce would be like since I was making it up on the fly, but it was absolutely perfect for the pasta! The sauce was rich from the half and half, a little tangy with the lemon zest and wine, there was a touch of sweetness from the roasted garlic, and some earthiness from the mushrooms that provided a little texture. Saute button mushrooms at medium high heat in a tablespoon of olive oil until mushrooms begin to brown. Saute the mushrooms in small batches and don’t over crowd the pan, otherwise you won’t get any color on the mushrooms. After a couple of minutes turn heat down to medium and add in two teaspoons roasted garlic. Stir the garlic around and let that cook for a minute or two. Toss in two teaspoons fresh grated lemon zest, salt and pepper, add about 1/2 cup of white wine, and reduce until wine is mostly cooked off and gone in the pan. Make sure to cook with wine you would drink because you will be concentrating those flavors. Finally, add 3 tablespoons of half and half or heavy cream, stir, and cook another minute. Serve with your favorite pasta and garnish with fresh grated parmesan cheese. I actually tossed the noodles directly into the pan with the sauce so the noodles can absorb all those flavors and every bit of sauce. Note: If the mushrooms absorb all the olive oil in the pan, don’t worry, you can just add a little more. Or if you really want to get your mushrooms brown, just leave the oil out, and turn down the temperature on the stove, and stir frequently to keep the mushrooms from burning. Seriously, this is one of the best sauces I have made! I could eat it with anything! Well, maybe not breakfast, but I could make a case for any other meal of the day. You find yourself wanting to come back again and again for more. I can’t imagine what else you could want out of a sauce. I know you will feel the same too! By the way, you could just spoon this over some grilled chicken, pork or fish. Just in case you wanted to think outside the box. You can’t go wrong. I promise!